. ::[ Gerakofolia - Guest house in Konitsa ~ Ioannina Greece | Location ]::. Place of imperious tops and full with trees gorges, region of infrequent natural beauty and unique cultural heritage. Konitsa, built in verdant side of Trapezitsa is a border city with her own dynamic, old mansions and stone alleys, next to the gorge of Aoos where is built the eminent one arch bridge. In the notherners meets the Mastorochoria of Sarantaporos that their residents, for centuries burrowed with taste the stone, building houses, monasteries and bridges in Greece. The therapeutical sources of Amarantos and Kavasila are known for their therapeutic attributes. The wider region, full from traditional settlements that remain intact from time, it is ideal for the tourists that seek adventure, but also for those who want to relax. It offers chances for mountaineering, ascension, glider, rafting and other extreme sports. 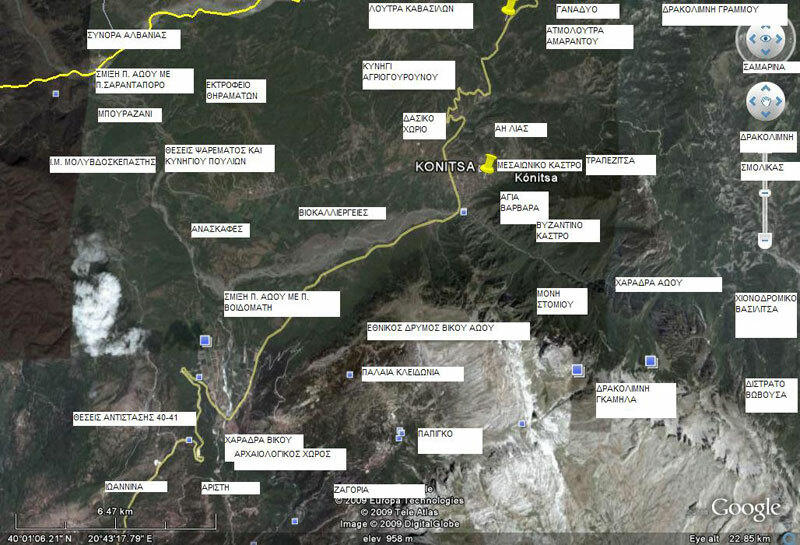 The Province of Konitsa is found in the mountains of Northern Pindos, in the north department of the Prefecture of Ioannina. It is extended from Grammos up to Tymfi and Smolika. It borders Easterly on W. Makedonia, (Kastoria and Grevena) and on Albania westwards. The intense geographic bas-relief and the flow of the rivers Aoos, Voidomatis and Sarantaporos determines the historical and cultural course of the place, while the human activity is encouraged by the existence of forests, meadows in the plates, flat extents, continuous flow of water, riparian vegetation, rich fauna.